Outlook emails with attachments to PDF, DOC, HTML, EML on a server. Convert Outlook emails with attachments to PDF, DOC, TIFF, HTML, EML. Server version. 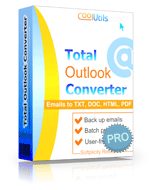 If you need a server-based Outlook converter to turn your emails to a more sharable format, Total Outlook Converter Pro X is your choice. It runs silently on a Windows server and processes your Outlook emails to DOC, PDF, HTML, XHTML, TXT, TIFF, JPEG smoothly. The unique option of this app is the ability to convert attachments. While most other email converters process just email bodies, Total Outlook Converter Pro X goes the extra mile. Backing up and archiving are easier when you have both emails and attachments in one format. Have to dig out emails as part of a legal investigation? Our converter is at your fingertips. It can also stamp bates or add page counters for your convenience. You can add Outlook converter to your app or system. We offer exe, dll and ActiveX for an easy implelentaion. Here is also a GUI version. Reach your emails without Outlook installed. 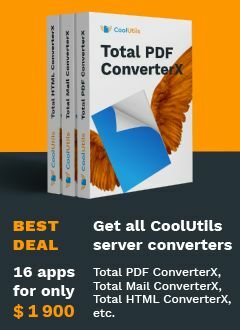 Make PDF or Doc copies in seconds with Total Outlook Converter Pro X. Need someone to reach you with more info? Request a call back 1-888-803-4224. "Your program came to my rescue when I had to dig out emails to and from an employee who left our district 8 years ago. We are a small K-12 district of about 500 students and received a public information request as part of a legal investigation." "The program did usually give a Windows memory error at the end of every batch of 50 to 100 messages, but it kept working through the errors and allowed me to get the job done in less than a day. Thank you!"